The International Agency for Research on Cancer (IARC), the cancer agency of the World Health Organisation, has scared meat lovers witless with its latest report. It's a thorough report: 22 experts, 10 countries and the accumulated international scientific literature on red meat. So it merits attention, though not necessarily wholesale panic and despair. It has classified red meat as probably carcinogenic to humans (Group 2A), based on "limited evidence that the consumption of red meat causes cancer in humans and strong mechanistic evidence supporting a carcinogenic effect". The main increased risk seems to be in bowel cancer, with a smaller association with pancreas and prostate cancers. Processed meat, which means meat modified to extend its shelf life by smoking, curing or adding salt and preservatives, comes out worse. It's classified as carcino-genic to humans (Group 1), based on "sufficient evidence in humans that the consumption of processed meat causes colorectal cancer". It has said that "each 50g portion of processed meat eaten daily increases the risk of colorectal cancer by 18 per cent". This is a relative risk, so if your overall risk of bowel cancer is very low, then even increasing your risk by this extent is unlikely to result in you getting it. But in global terms, the small increases in risk to individuals translate to a significant rise in cases. Dr Christopher Wild, the director of IARC, says: "These findings further support current public health recommendations to limit intake of meat." But, he adds: "At the same time, red meat has nutritional value. Therefore, these results are important in enabling governments and international regulatory agencies to conduct risk assessments, in order to balance the risks and benefits of eating red meat and processed meat and to provide the best possible dietary recommendations." Meat lovers point to the fact that smoking, alcohol and obesity are greater risk factors for early death than meat. True, but tackling one doesn't mean ignoring the other. So now we're left in limbo. Red meat remains the most nutritionally efficient way of replacing iron that we need to make haemoglobin. Lean meat is a good source of low-fat protein needed for repair and growth. It is quite true that processed meat, full of salt and often containing nasty bits of ground-up rubbish, is an expendable part of our diets. But sausages and sliced processed meats are delicious and that counts for something too. I am quite prepared to run the small extra risk of bowel cancer in return for the processed meat and mustard sandwich that I make myself a couple of times a week. I know it's not good for me, but it's a choice I make. But given the growing body of evidence about its link with cancer, it would seem sensible to label processed meat with a clear health warning. Parents will be rightly discouraged from feeding it to their children. And schools should consi-der banning processed meats and limiting red meat in school dinners. Eating red meat twice a week - so long as it's not in blow-out proportions - is unlikely to raise your risk of bowel cancer to a significant extent. Any meat with a suspiciously long shelf life is probably not particularly good for you. But if you're an adult with capacity and free will, you may decide to buy it anyway. 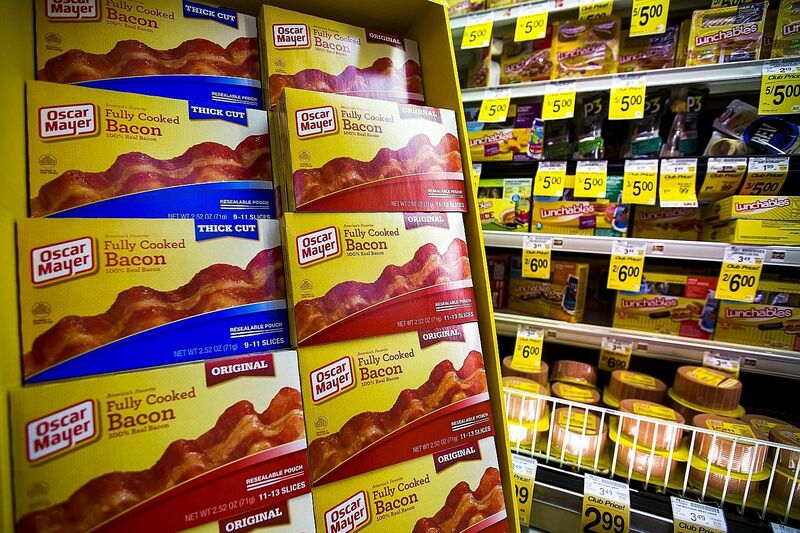 We need to know more about which processed meats are the most risky, and in what amounts, before we can say whether kids should avoid them. In the meantime, we don't need to ban bacon and stop salami - but little and not often would seem wise.